Exciting astronomical news! 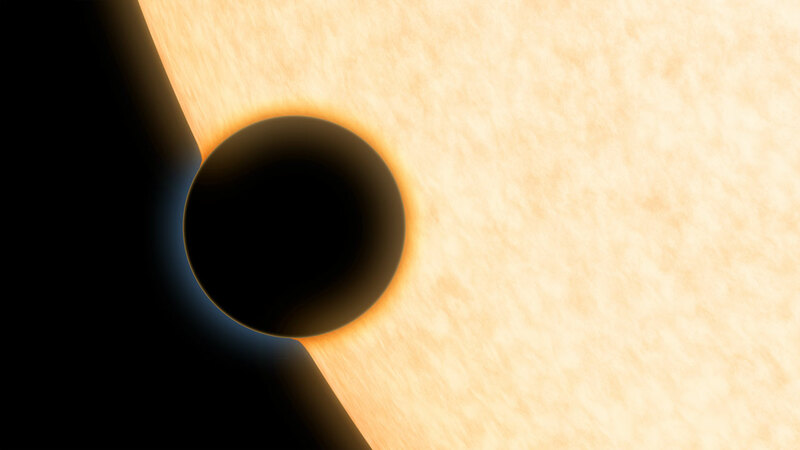 With the help of Hubble Telescope, astronomers detected water vapors on an exoplanet. HAT-P-11b is 124 light years away from Earth. So far, astronomers managed to observe atmospheric characteristics of Jupiter-sized exoplanets. HAT-P-11b has a size similar to Neptune, making it the smallest planet outside of our solar system ever to have its most important atmospheric features analyzed by astronomers. HAT-P-11b is roughly four times larger than Earth, but the exoplanet is 25 times heavier. HAT-P-11b, an exoplanet discovered in 2009, breaks another record in astronomical research. With a temperature of 1,580 degrees F, this is the coldest planet with key atmospheric components assessed by astronomers. A complete revolution takes the cloudless exoplanet only five days, as it is much closer to its star than the Earth is to the Sun. The discovery was made by analyzing the changes suffered by the spectrum of light emitted by its host star. The detection of water vapor signs was possible because the upper atmosphere of the alien planet is cloudless. Cloud formations are featured by numerous planets and they constitute one of the most significant hindrance in astronomical exoplanet research. “Water is the most cosmically abundant molecule that we can directly observe in exoplanets, and we expect it to be prevalent in the upper atmospheres of planets at these temperatures,” lead author Jonathan Fraine said. The research team triangulated data from NASA’s Hubble Space Telescope’s Wide Field Camera 3, data from the Kepler program and the Spitzer Space Telescope, an infrared telescope launched by NASA in 2003. Fraine adds that the discovery proves our increasingly sophisticated spectrum analysis. By confirming that astronomical methods progress, the discovery raises the bar for other researchers. From now on, other Neptune-sized exoplanets will be under the radar, as astronomers hope they will soon find an Earth-like planet. Moreover, by discovering signs of heavy elements, the research team provides a confirmation to an astronomical theory: the production of planets takes place as the dust and gas around the stars gather around a rock or piece of ice that begins accumulating mass. James Webb Space Telescope will be launched in 2018. The 21 feet diameter mirror of Hubble’s successor will provide unprecedented images of distant stars and planets. Astronomers will have a chance to observe the formation of the first stars and galaxies, as well as the reionization epoch. Neptune-sized exoplanets, as well as Super Earths, will be spotted right away by the next-gen space telescope.